Managing Addressers and Addressees - Douglas Computing, Inc. If you send letters repeatedly to several addressees, it is highly advantageous to store their addresses in the DC Envelope Printer's database. This allows you to quickly select the address of an addressee, when you are configuring an envelope to be printed. You can also store multiple return address records, which also allows you to quickly select an appropriate return address, when you are configuring an envelope to be printed. 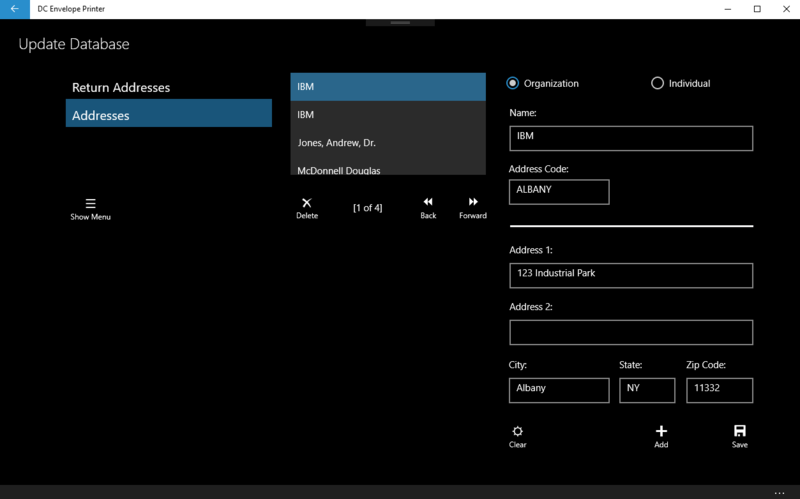 To add address records for addressees, to the app's database, you may from the main page or bulk mail main page of the DC Envelope Printer, click on the Update Database button on the bottom menu bar, to access the Update Database page for the app. On the left of the Update Database page, you may click on the Addresses button, and then start entering addressee information. First, click on the Add button on the bottom right of the page, to begin adding an addressee to the app's database. If the addressee is an individual, ensure you provide at least a first or last name to validate the record. If the addressee is an organization, ensure you provide at least the name of the organization, to validate the record. You can initially create a record, and update it later if you please. You can save a record by clicking on the Save button, to the right of the Add button. You can alternately save a record by clicking on the Back or Forward button, under the names list box, in the middle of the page. If you started adding or editing a record, and you want to back out of it, click on the Clear button, to the left of the Add button, in order to do so. After you enter multiple addresses, you may scroll through the records using the Back and Forward buttons, under the names list box - which contains a list of addressee names, whose records you have entered. You may jump directly to an addressee record, by scrolling up and down through the names in the names list box, and selecting a name. To delete one or more records at once, select their corresponding names in the names list box, and click on the Delete button, below the names list box. If after you have entered several addressee records, and you would like to sort the records alphabetically, click on the Order Records button, on the bottom menu bar for the page. Addressee records contain an Address Code field. This field, which is not printed on envelopes, helps distinguish between different addresses for a given addressee. For example, if you mail letters to different offices for a company at different locations, you can use the field to distinguish one location from the next. For example, if you have IBM as an addressee, you can enter MAIN OFFICE in one record, SPRINGFIELD OFFICE in another, etc. If two addressee records have the same name, but are not differentiated using the Address Code field, you will encounter a duplicate record error. If you mail letters from one or more locations, or several persons use this app, you may want to add a list of addressers to the app's database. To do so, click on the Return Addresses button on the left of the page, and enter addresser information the same way you enter addressee information. You may return to the main page of the app, by clicking on the large back arrow, at the top left of the page.